John Catucci (@johncatucci) is back with Season 4 of You Gotta Eat Here! premiering on Friday, January 30th. Tune in to watch him discover Canada’s most delicious, mouthwatering and over-the-top comfort food. The half-hour episodes follows John crisscrossing the country (and occasionally, going over the border) in search of delicious eats. In the past, he’s made visits to some of my personal favourites in Toronto including Beast, La Cubana, Caplansky’s and the Gabardine to name a few. In celebration of the new season, I’m giving away one pair of tickets to the You Gotta Eat Here! Season 4 Launch Party on Friday, January 30th which begins at 8pm. The party will be held at a restaurant in downtown Toronto (details will be provided to the winner). 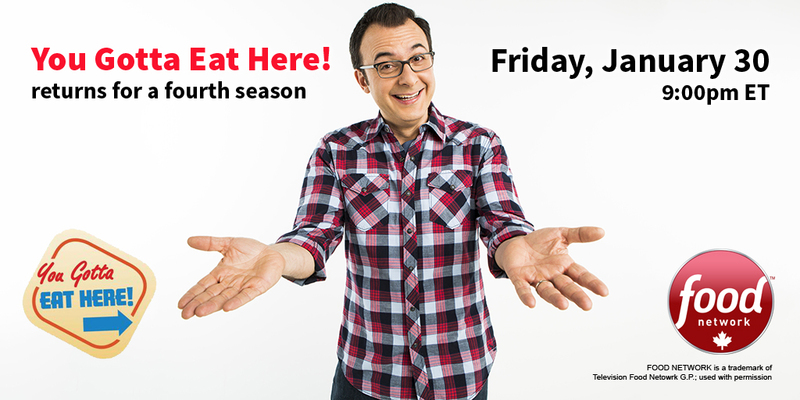 Enjoy incredible food, company, and meet the host, John Catucci! The giveaway ends on Thursday, January 22nd at 11:59pm. A winner will be randomly selected and announced shortly thereafter. Please note that you must be 19+, live in the GTA and transportation to/from the event will not be provided. Enter via rafflecopter below. You can tweet once per day for extra entries. Good luck! My boyfriend and I are SUCH foodies and this would be such a dream date! I would love to see Korean Cowboy at Yonge and Eg featured on the show! Love their kimchi corn! Love watching the show. When I travel led to newfoundland last year I went to Chafe’s Landing… cause it was on your show!!! I absolutely LOVE this show! John Catucci is the best. It would be a dream to go to the launch party! I think it would be awesome to see Rose and Sons featured on the show. Rose and Sons is always a good time! Same here! The worst is watching it before bed. It’s hard to sleep with a growling stomach! I’d love to see Sabroso (In Brampton) featured! Love their food! I’d love to see Pour Boy featured. Good choice – love those tacos! Monique’s in Blind River, ON. This place has been on my list for a while. I really need to check it out! I still think about the Rose and Sons BLT I enjoyed at Taste of Toronto. I’d love to see them featured. Love to see some new restaurants that has just opened recently featured! My new favourite in Toronto is Hawthorne Food and Drink. Their food is AMAZEBALLS! I’d like to see El Caballito Tequila Bar on King Street W.
You Gotta Eat Here should feature Farmhouse Tavern! Too many to choose! Mother’s Dumplings perhaps! Amazing show! Fingers crossed to ein this . Looks like fun night,great food no doubt! I would love to see Restoran Malaysia featured on You Gotta Eat Here! I’m a huge fan of Rock Lobster East & Burgers Priest! they’re both in my hood! GBK, Chino Locos & Dangerous Dans are also awesome & Super close to home!! I’d love to see Gasthaus featured. I would love to see grand electric on the show! I would love to see this izakaya in my hood called Nome Izakaya featured!